A while back I did some consulting work for a small ISP who had received complaints from a few customers that believed they could not use the ISP’s SMTP server to send email to outlook.com or hotmail.com accounts. These customers claimed they never got any bounce message (Non-Delivery Report) in return, so they firmly believed the problem resided with the ISP. Dear Microsoftian overlords, we’ll be good from now on. After checking the IP addresses in question against all publicly available DNS based email blacklists, I performed the standard sender test by using the ISP’s SMTP server to mail a few messages to my own outlook.com account. This was done while closely monitoring the communication between the ISP’s SMTP server and the receiving SMTP server on behalf of outook.com. Any lost soul administrating SMTP servers is painfully aware that there is an abundance of potential errors causing delivery between these servers to fail . The only reliable approach is to observe the message log and study the communication between the sending and receiving SMTP server. In this case, I could confirm that my message was accepted and received by mx4.hotmail.com. 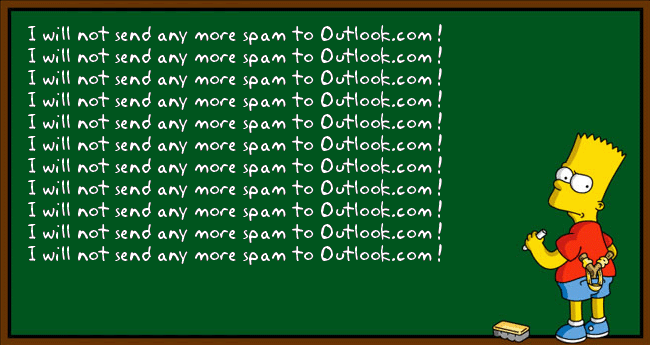 When I checked my outlook.com account, I found my message waiting in my inbox as expected. Everything seemed to be working just fine and I suspected this was just another case of mail ending up in the spam folder. I also made sure to check the list of messages reported as not being delivered to outlook.com from the customers, and could confirm that those messages was received and accepted by mx[1-4].hotmail.com as well. We have not identified any problem with our services, please consult your service provider. That was a let down as I had already confirmed that the messages in question had been delivered, and there was never any NDR from outlook.com. Besides, that kind of answer told me that “Support” had at best glanced at the service health dashboard. To eliminate the possibility that my sender address had been whitelisted by my own outlook.com account by reason of prior relationship, I signed up for a brand new outlook.com account. When I tried to mail my new outlook.com account from the same sender address as before, I could again confirm that mx[1-4].hotmail.com accepted and received the message. One notable difference this time around though: the message never ended up in my outlook.com inbox (or spam folder), even after repeated efforts. This would suggest (the following is speculation) that in addition to DNS based blocking (which will reject “bad hosts” when connecting to mx[1-4].hotmail.com) and whatever other enforced policy they’re applying, Microsoft is also doing some rather aggressive IP filtering on their end. However, this filtering will take the backseat if the sender address is known by the receiving outlook.com account. I guess this would imply that any address added to your outlook.com contact list would also be whitelisted. Our research shows that there are no active blocks against these IP’s, but some messages were filtered. We have confirmed that these IP’s qualify for conditional mitigation but can be subject to low daily email limits until they have established a good reputation. Please note that mitigating this issue does not guarantee that your emails will be delivered to a user’s inbox. Guarantees or not, our delivery “issues” with outlook.com and hotmail.com accounts were resolved in a couple of days.